Arduino boards are widely used in robotics, embedded systems, and electronic projects where automation is an essential part of the system. These boards were introduced for the students and people who come with no technical background and Engineers alike. Digital Input / Output Pins. 2 A0 – A7 Analog Input / Output Pins. 3 Pin # 3, 5, 6, 9, 11 Pulse Width Modulation ( PWM ) Pins. 4 Pin # 0 (RX) , Pin # 1 (TX) Serial Communication Pins. 5 Pin # 10, 11, 12, 13 SPI Communication Pins. 7 Pin # 13 Built-In LED for Testing. 8 D2 & D3 External Interrupt Pins. 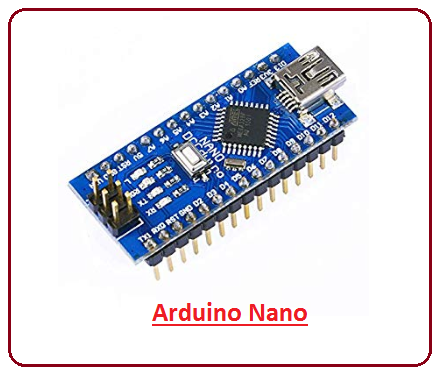 Arduino Nano is a small, compatible, flexible and breadboard friendly Microcontroller board, developed by Arduino.cc in Italy, based on ATmega328p ( Arduino Nano V3.x) / Atmega168 ( Arduino Nano V3.x). It comes with exactly the same functionality as in Arduino UNO but quite in small size. It comes with an operating voltage of 5V, however, the input voltage can vary from 7 to 12V. Arduino Nano Pinout contains 14 digital pins, 8 analog Pins, 2 Reset Pins & 6 Power Pins. Each of these Digital & Analog Pins are assigned with multiple functions but their main function is to be configured as input or output. They are acted as input pins when they are interfaced with sensors, but if you are driving some load then use them as output. Functions like pinMode() and digitalWrite() are used to control the operations of digital pins while analogRead() is used to control analog pins. The analog pins come with a total resolution of 10bits which measure the value from zero to 5V. Arduino Nano comes with a crystal oscillator of frequency 16 MHz. It is used to produce a clock of precise frequency using constant voltage. There is one limitation using Arduino Nano i.e. it doesn’t come with DC power jack, means you can not supply external power source through a battery. This board doesn’t use standard USB for connection with a computer, instead, it comes with Mini USB support. Tiny size and breadboard friendly nature make this device an ideal choice for most of the applications where a size of the electronic components are of great concern. 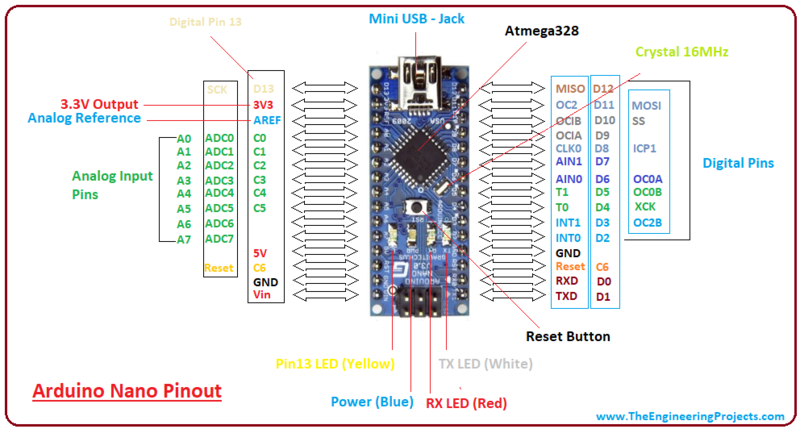 Flash memory is 16KB or 32KB that all depends on the Atmega board i.e Atmega168 comes with 16KB of flash memory while Atmega328 comes with a flash memory of 32KB. Flash memory is used for storing code. The 2KB of memory out of total flash memory is used for a bootloader. The SRAM can vary from 1KB or 2KB and EEPROM is 512 bytes or 1KB for Atmega168 and Atmega328 respectively. This board is quite similar to other Arduino boards available in the market, but the small size makes this board stand out from others. 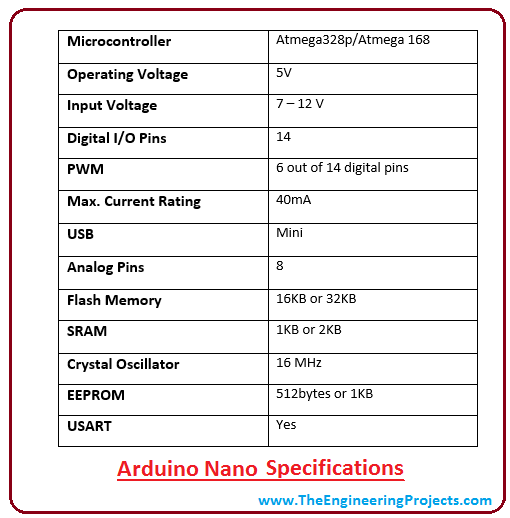 Following figure shows the specifications of Arduino Nano Board. It is programmed using Arduino IDE which is an Integrated Development Environment that runs both offline and online. No prior arrangements are required to run the board. All you need is board, mini USB cable and Arduino IDE software installed on the computer. USB cable is used to transfer the program from computer to the board. No separate burner is required to compile and burn the program as this board comes with a built-in boot-loader. Following figure shows the pinout of Arduino Nano Board. Each pin on the Nano board comes with a specific function associated with it. We can see the analog pins that can be used as an analog to digital converter where A4 and A5 pins can also be used for I2C communication. Similarly, there are 14 digital pins, out of which 6 pins are used for generating PWM.